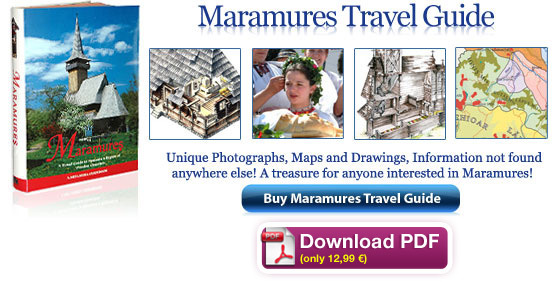 Life in Maramureş is marked by a series of events, holidays and festivals that repeat themselves each year. These old traditions are well conserved in this isolated part of Romania. A cooked and decorated hen, with a cigarette stuck in its beak, is an important part of the wedding ritual. – Anul Nou (New Year): From the 31st of December until the 6th of January is the time to make good wishes (urături). Very humorous are the theatrical performances called Capra (The Goat) and Ursu (The Bear), when people wearing masks dance and utter comical lyrics. – Festivalul de Colinde, Datini şi Obiceiuri de Iarnă la Ucrainieni (The Festival of Ukrainian Carols, Winter Customs and Traditions) – Sighetu Marmaţiei. – Serbările Zăpezii (Celebration of the Snow) – Borşa Resort: Usually in the first weekend of March; various performances on snow, winter sports, music, dance and good humour. – Serbarea lenker-ului (Celebration of the lenker) – Cavnic: A weekend at the beginning of March is dedicated to winter sports contests, music and dance. 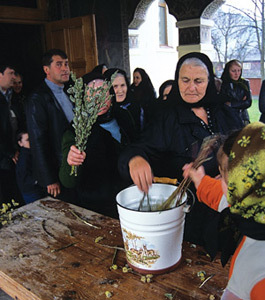 Udatoriul – Old agrarian ritual, celebrating the most hardworking man of the village. 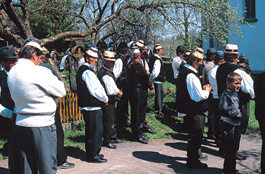 – Udătoriul – Şurdeşti: Old agrarian ritual, celebrating the most hardworking man of the village (udătoriu’), whose selection is strict: he, together with other hardworking people, is observed for a long time by a jury of old men before being elected. 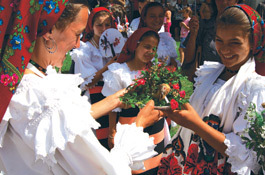 – Câte flori pe Iza-n sus (All the flowers up on Iza Valley) – Dragomireşti: Folk festival on the first Sunday after Easter, with folk dances, songs and costumes. Groups of musicians attend all weddings. – Tânjaua de pe Mara – Hoteni. 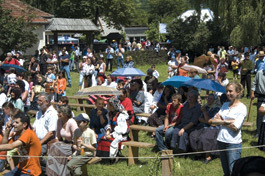 A festival of agrarian customs, held in the villages of Hoteni, Sat Şugatag and Hărniceşti. The whole village, wearing their traditional costumes, gathers in order to celebrate the most hardworking man, the one who ploughed first his field. He is seated on a tileguţă (small carriage) covered with colourful woven carpets and pulled by several young men. 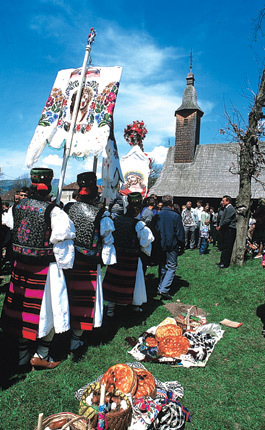 Pairs of young men carry the (usually) 12 tânje that are decorated with branches, flowers, white towels and coloured ribbons. – Armonii de primăvară (Spring Harmonies) – Vişeul de Sus: Folk and literature festival, with a tradition of almost 30 years. 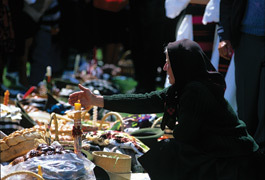 One of the most popular festivals during the summer is the Wedding Festival held in Vadu Izei. – Obiceiuri de primăvară la ucrainieni (Ukrainian Spring Customs) – Crasna Vişeului, Bistra, Valea Vişeului. 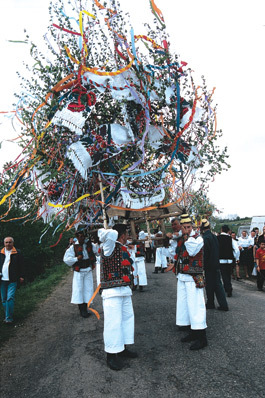 – Ruptul Sterpelor (Separating the barren sheep), also called Sâmbra oilor (Gathering the sheep): Old tradition, present in all the villages of Maramureş. At the beginning of May, the sheep are grouped into herds and sent to sheepfolds in the mountains for the summer. The milking sheep are separated from the non-milking ones; the milk is measured in order to establish the quantity of dairy products to be given to each sheep owner. This is why the tradition is sometimes called Mulsul măsurii (Milking of the Measure) or Măsurişul laptelui (Measuring of the Milk). Old women on church light a candle in Easter Sunday. – Sărbătoarea portului popular (Celebration of the Traditional Costumes) – Cupşeni: Folk festival dedicated to traditional and wedding costumes in the Land of Lăpuş. – Floare mândră de pe Iza (Beautiful Flower in the Iza Valley) – Şieu: Folk festival dedicated to authentic dance and songs singing contest for both children and adults; a parade of folk costumes. – Sărbătoarea Narciselor (Festival of the Narcissi) – Repedea. Willow branches with catkins are dipped in holy water before being taken home on Palm Sunday. 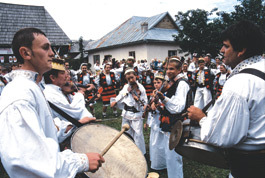 – Jocul Bărbătesc (Men’s Dance) – Petrova: Traditional dances for men, a drumming contest, folk music and costumes. – Serbările Lăpuşului (Lăpuş Days) – Târgu Lăpuş: One of the most important folkloric festivals in the Land of Lăpuş: contests, popular art, concerts. – Nu vă uitaţi că-s micuţ (Do not look for I am small) – Budeşti: Folkloric contest for children’s ensembles that compete in traditional dancing and singing. – Festivalul Gulaşului (Festival of the Goulash) – Ocna Şugatag: A celebration of the Hungarian community and its national dish: the goulash; cooking contests. Spectators at the Wedding festival of Vadu Izei. 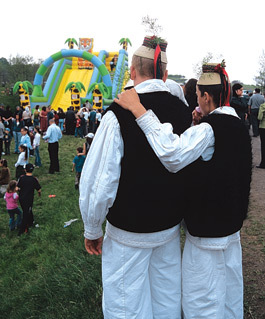 – Serbările Vişeului (Vişeu Days) – Vişeu de Sus: Folkloric and cultural events. – Serbările Chioarului (Chioar Days) – Şomcuta Mare: Parade of traditional costumes, popular music and dance. – Jocul vălenarilor (The Dance of the People of Văleni) – Văleni: Traditional music, dance and costumes. – Sărbătoarea cositului şi a plăcintelor (Celebration of Haymaking and of Pies) – Mesteacăn: Women of Mesteacăn village compete in making the “curliest pies” (plăcinte creţe) and in making hay. – Sânziene: On the 24th of June to celebrate the summer solstice. – Hramul Mănăstirii Bârsana (Day of Bârsana Monastery’s Patron Saint) – Bârsana: On the 30th of June, the day of the Synaxis of the Twelve Apostles, pilgrimage to the Monastery of Bârsana. – Serbările Cavnicului (Cavnic Days) – Cavnic: During one of the summer months, open air concerts, contests, the most important of which is that of sowing. Barbati carand pluguri simbolic decorate la festivalul Tanjaua de pe Mara. – Festivalul international de nunti (International Wedding Festival) – Vadu Izei: In early June; an important festival presenting traditional wedding rituals, popular costumes, dances and songs. – Zilele oraşului Seini (Days of Seini Town) – Seini: Various cultural events and shows. – Festivalul dansului, cântecului şi portului de pe Fisculaş (Festival of Dance, Song and Costumes in Fisculaş) – Dumbrăviţa: Festival of the traditions of the villages between Baia Mare, Baia Sprie and Lăpuş River. – Tabăra de sculptură, pictură şi ceramică (Sculpture, Painting and Ceramics Camp) – Sighetu Marmaţiei: Skilled traditional artists exhibit their hand made objects. – Hramul Mănăstirii Dragomireşti (Day of Dragomireşti Monastery’s Patron Saint) – Dragomireşti: On the 20th of July, the feast of St Elijah; a pilgrimage to the monastery and its miracle-working icon. A priest blesses food on Easter Sunday. – Sus pe Valea Vaserului (Up in the Vaser Valley) – Vişeu de Sus: In early August, a festival dedicated to the German minority, called ţipţeri, of Vişeu and the Vaser Valley. – Festivalul Stuparilor (Festival of the Beekeepers) – Cerneşti: On the first Sunday after the 15th of August; a celebration of apiculture. – Pântru mândra din Botiza (For my Sweetheart in Botiza) – Botiza: Traditional music, parade of popular costumes, contests, campfires. 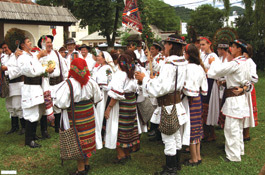 – Hora la Prislop (Round Dance at Prislop) – Prislop Pass, Borşa. – Zilele Culturii “Roza Rozalina” (“Roza Rozalina” Cultural Days) – Rozavlea: Folkloric festival dedicated to the preservation of traditions and customs. – Festivalul dansului şi cântecului chioarean (Festival of Dances and songs of Chioar) – Satulung: Folkloric festival promoting traditions typical for Chioar; a parade of traditional costumes, music and dance. 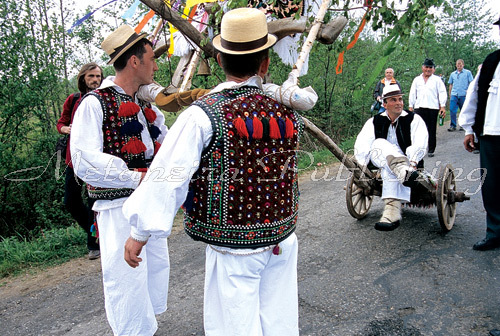 – Jocul Satului (The Village Dance) – Sat Şugatag, Breb, Hoteni: In late August – early September, for three Sundays in a row, one for each of the three villages. Men always wear a hat(clop) and vest is a common attire for a Sunday. – Hramul bisericilor din Ieud (Day of Ieud Churches’ Patron Saint) – Ieud: On the 8th of September is celebrated the Birth of the Holy Virgin, which is the patron saint of both old wooden churches of Ieud. – Zilele oraşului Sighet (Sighet Town Days) – Sighetu Marmaţiei: Music, concerts, exhibitions, dance, etc. – Târgul Cepelor (The Onion Fair) – Asuaju de Sus: Dating, according to oral tradition, from the time when onions did not even exist in this region; celebration of traditional music and costumes in Codru. – Sărbătoarea Castanelor (The Chestnut Feast) – Baia Mare: In late September – early October, when chestnuts are mature; celebration of the symbol of Baia Mare. – Balul Strugurilor (The Grape Ball) – Câmpulung la Tisa: In late September – early October; a festival dedicated to grapes and the youth of the village, marking their entry in society. – Ziua recoltei (Harvest Day) – Remeţi: In late September – early October; celebration of the harvest; folkloric music bands, costumes and traditional dances. 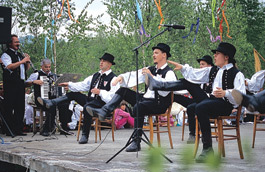 Musical groups entertain during celebrations and festivals. – Europa km 0 – Festivalul Internaţional de Poezie (Europe km 0 – International Poetry Festival) – Sighetu Marmaţiei: Poetry recital, book releases, folkloric events. – Serile de poezie “Nichita Stănescu” (Nichita Stănescu Poetry Evenings) – Deseşti: An event dedicated to the Romanian poet Nichita Stănescu. – Hramul bisericilor de lemn din Deseşti şi Poienile Izei (Day of Deseşti and Poienile Izei Churches’ Patron Saint) – Deseşti, Poienile Izei: On the 14th of October is celebrated St. Parasceva, the patron saint of the two old wooden churches. – Alină-te, dor, alină (Ease off, you longing, ease off) – Cicârlău: Folklore festival dedicated to authentic music; famous artists and beginners perform, contests. New and old meet everywhere: traditional costumes and an inflatable slide at a folk festival. – Joc la şură (Dance at the Barn) – Groşi: Celebration of traditional dance; the last dance before the Christmas fasting period. – Cânt şi joc pe plai străbun (Song and Dance in Ancient Land) – Dumbrăviţa: Celebration of traditional dance and music; the last dance before the Christmas fasting period. – Hramul bisericii de lemn Budeşti-Josani (Day of Budeşti-Josani Church’s Patron Saint) – Budeşti: On the 6th of December, the celebration of St. Nicholas. – Festivalul Obiceiurilor de Iarnă (Winter Customs Festival) – Târgu Lăpuş: Folkloric festival of winter traditions in Lăpuş and Chioar; parade of folk costumes, traditional performances typical of Christmas and New Year. – Hanukkah Festival – Sighetu Marmaţiei: Eight-day Jewish festival held at the end of December by the Jewish community of Sighet. – Festivalul datinilor de iarnă “Marmaţia” (“Marmaţia” Festival of Winter Customs) – Sighetu Marmaţiei: A 40-year-old festival celebrating winter traditions in Maramureş. 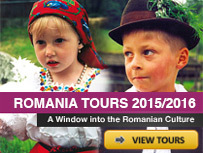 Plan to be in Romania 15-30 July and want to spend most of that in Bucovina and Maramures. Are there any organized tours available? Where else can real men look so charming in such delightfully silly hats! One has to make a date to experience all this . . .